Bottom Line: Retail investors are concerned about the role of proxy advisory firms and the impact of these firms on the proxy voting process. Investors seek greater transparency over these companies and the influence they might have on their investments. The research validates the concern investors have regarding proxy advisory firms and the desire for greater oversight over them. This survey of 5,159 retail investors demonstrates a disconnect between the expectations of everyday investors and the increasing influence of proxy advisors, companies that provide voting services to the investment firms managing retail investor money. The survey gauges retail investors' concerns regarding fundamental flaws in the proxy advisor industry, including conflicts of interest, robo-voting, and insufficient transparency. The increased focus of fund managers and proxy advisors on political and social activism, rather than maximizing returns, is out of sync with the expectations of ordinary investors. This practice has the potential to negatively impact returns for all retail investors by increasing the burden on public companies with no clear link to shareholder value. The absence of the inclusion of retail investors in the proxy process – as demonstrated by the participation levels and their inability to influence institutional shareholder voting – means that the voice of retail investors, who own 30 percent of public corporations in the United States, is being drowned out. 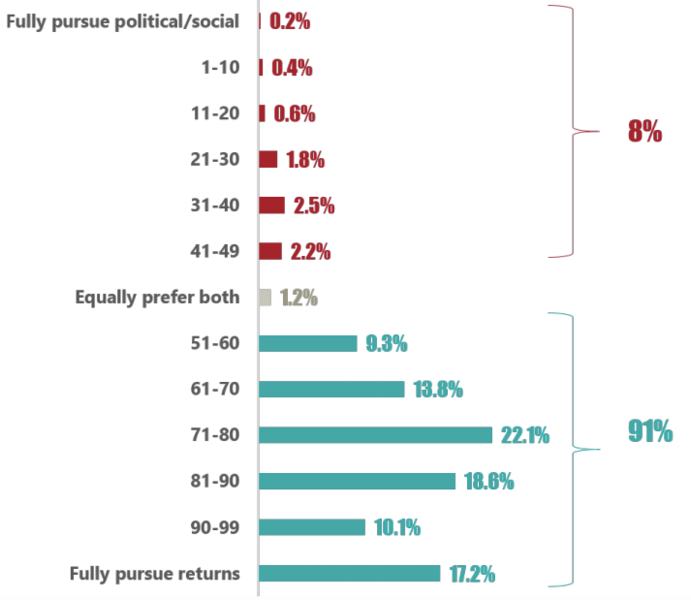 91 percent of retail investors indicated a preference for wealth maximization over political/social objectives. Of those that are very familiar with proxy advisors, 96 percent at least slightly supported increased SEC oversight. 84 percent of retail investors indicated robo-voting was at least a slight concern, and 79 percent of investors at least slightly supported SEC adoption of changes to address this issue. Over 95 percent of retail investors indicated that remaining unbiased from conflicts of interest was important in proxy advisor recommendations. 86 percent of retail investors indicated support of SEC oversight regarding inadequate proxy advisor transparency, specifically to address one-size-fits-all approaches. The findings of the retail investor survey show a wide gulf between the expectations of the retail investor community and institutional investors and proxy advisors who purport to act on their behalf. Conflicts abound in the proxy advisor industry that exacerbate that gulf, while a lack of transparency in the operation of proxy advisors strips retail investors of the ability to determine whether proxy votes are being registered with the sole goal of maximizing shareholder returns. The SEC’s work in this area can help to address that gap. The increased focus of fund managers and proxy advisors on political and social activism, rather than maximizing returns, is out of sync with the expectations of ordinary investors. This disconnect, as well as other fundamental proxy advisor concerns, validate the concern investors have regarding proxy advisory firms and the desire for greater oversight over them.